There is a unique circumstance surrounding the elevation of Saint John XXIII to the cardinalate. He was nuncio in France, and it was announced that he was going to be elevated—also, one of them to be elevated with him was Stefan Wysznski who then became the Primate of Poland and played a very big role in John Paul II’s life. So those two were made cardinals at the same time. There was an ancient tradition in the Church where a Catholic head of state could actually reserve the right to bestow the red hat, the biretta. And so that’s what happened. 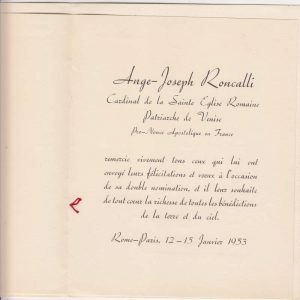 The president of France, Vincent Auriol, wanted to invoke this ancient tradition, as a sign of his esteem, since that’s where Roncalli was serving at the time. And he did. 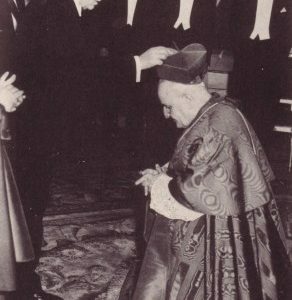 Pius XII was not the one that actually put the hat on him. It was the president of France, which was very unique in modern history, but not so unique in ancient history. 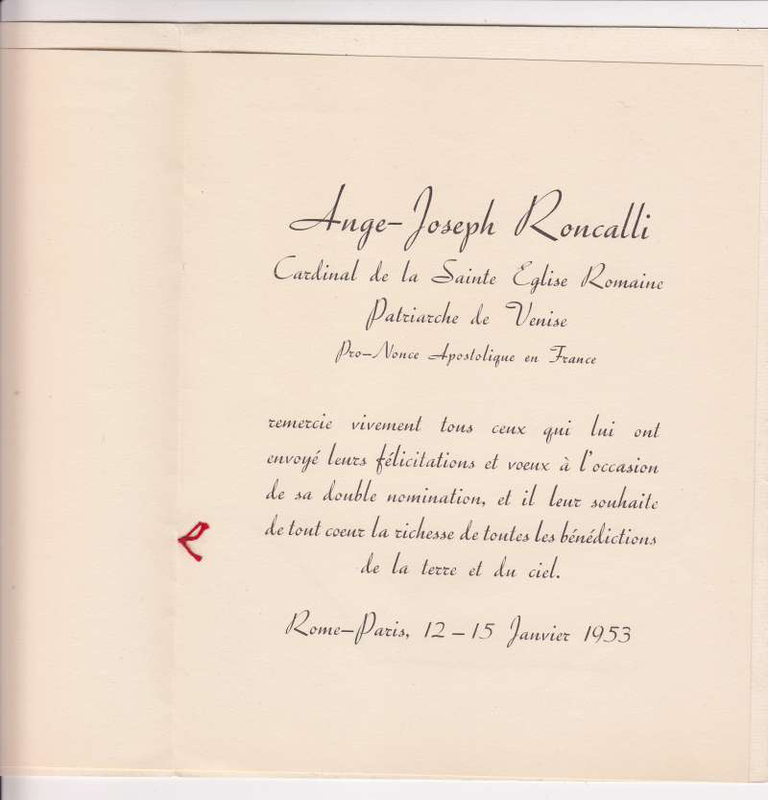 The item we have here is actually a card that the new Cardinal Roncalli printed to send as a thank you to people who had sent him greetings and congratulatory notes upon his elevation. Roncalli had a number of different roles prior to becoming a cardinal. He entered seminary at the age of twelve, which was a very young age and rarely happens anymore. Then, half way through seminary he left his studies to join the military service for a year or two. He actually did this a couple of different times. Then, he went back to seminary, and after ordination, served as a chaplain in the military. You can see really old pictures of him in his military uniform. And then he served for the Holy See in some different places: Turkey, Bulgaria, and Greece; he also helped find prisoners of war who were still missing. Then, he ended up in Paris as nuncio to France. He was a very active man in regards to being a soldier: he was a soldier for the Church. He did so many different things on various levels, but he was never thought of as a leading contender of “papabile” character. He was an older, jovial man, a happy man, but not a contender for the papacy. This item is unique because he had it printed himself. 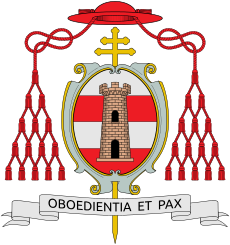 And we see the cardinal coat of arms with the galero, which is actually on a bishop’s coat of arms as well, but this one has more tassels, so you know it’s a higher office. It also has his motto, Obedience and Peace, which he kept as his motto as pope. And the lion is significant because of his role as patriarch of Venice. He’s actually one of three popes of the 20th century that have the lion in their coats of arms, because three popes were elected out of Venice. 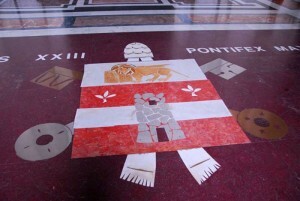 They are Pius X, John XXIII and John Paul I.
John XXIII had his coat of arms put into the entry of Saint Peter’s Basilica, and there’s a great story connected to it: people complained that the lion was smiling. It was Giacomo Manzu who was the artist. Manzu refused to remove his work until it was previewed by Pope John XXIII who, upon seeing it, is reported to have said, “I like happy lions.” And so it is still there. 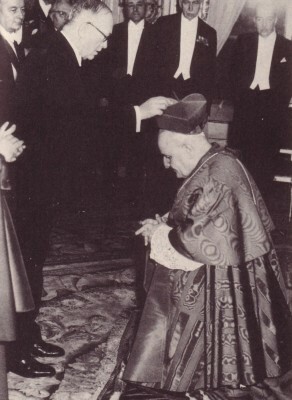 In 1959 the recently elected Pope John XXIII received Vincent Auriol. Here is a you-tube of that meeting.